It’s always a good idea to be looking forward in business. The New Year is upon us and is a perfect excuse for reflection on what’s working, what’s not, and what needs to change. 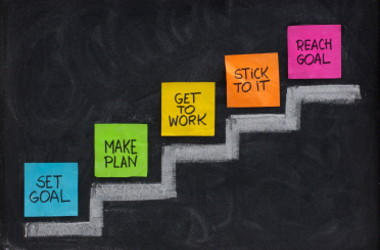 Get your small business, and your life, on track with these resolutions for the coming year. This is a popular topic among lifestyle bloggers, but it holds true for businesses, as well. Get rid of anything that isn’t adding to your business. This could mean paperwork, but it’s also about those dusty ideas that you brought with you in the beginning that just haven’t taken off. It can be hard to let go of your first big idea, but sometimes it’s necessary so that you can move on — in the right direction. The stock market is volatile these days, but there are plenty of other ways for you to invest in both your business and yourself my response. Try skimming a small amount of money from your profits each month and putting them in a sub account for your business. In no time at all, you’ll be able to make some major improvements. Shake up your company with new furniture, business cards, freelance help, product development, better marketing/PR − the possibilities are nearly endless! It’s something many entrepreneurs neglect, but try adding a vacation day to your calendar. If business is going well, you’ve earned a few days off, and if it isn’t, it might do you some good to step away for a day and come back with fresh ideas. Most entrepreneurs go into business for the joy of it. Whether it’s the end of your first year or your 15th, you might feel exhausted or defeated. In the coming year, try to focus on the things you love about your business. Working for yourself, setting your own hours and pursuing your passion might be just a few of the reasons you invested in a startup. Get back to those basics and enjoy your work! To see the four remaining resolutions to improve your business and your life, visit entrepreneur.com, where it was originally published. Copyright 2014 by Entrepreneur Media, Inc. All rights reserved.